Borough President Ruben Diaz Junior and his director of Planning & Development James Rausse at the Bronx Borough hearing on the Jerome Avenue rezoning on November 2, 2017. 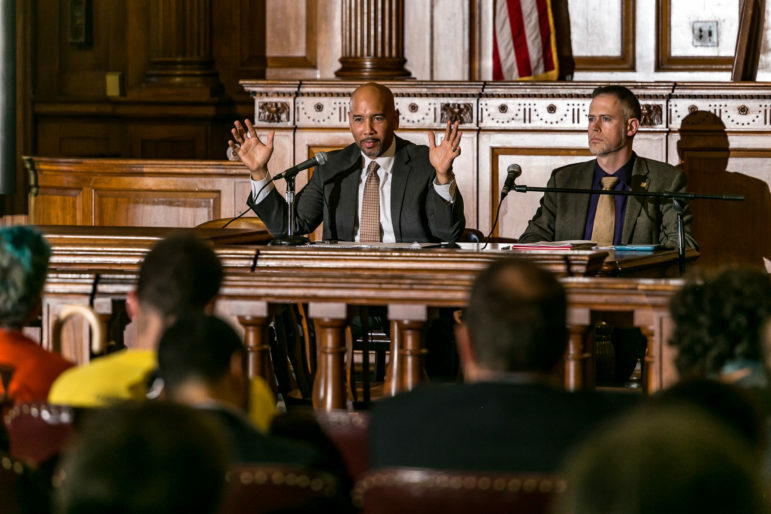 On Monday morning, Bronx Borough President Ruben Diaz Jr. voted in favor of the Department of City Planning’s proposed Jerome Avenue rezoning with conditions. The Bronx Borough Board voted in favor—and each of the community board representatives involved in the vote have already individually proffered a list of their own conditions. The rezoning will promote housing development along 92 blocks of Jerome Avenue and come with a suite of other programs and investments in the surrounding neighborhoods. The proposal is the fourth neighborhood rezoning sponsored by the de Blasio administration as part of the mayor’s affordable housing plan to make its way through the seven-month public review process known as the Uniform Land Use Review Procedure (ULURP). In that process, the affected community boards, borough president and borough board cast non-binding votes on a land use project. Next comes a vote by the City Planning Commission and a final, binding decision by the City Council. The Bronx Borough Board consists of community board representatives and each of the Bronx’s City Councilmembers and is chaired by Diaz. There were plenty of reasons to expect that the Bronx Borough Board and the Borough President would vote affirmatively on the Jerome Avenue rezoning. In October, Community Boards 4, 5 and 7 each voted individually in favor of a rezoning with conditions. Local councilmembers Vanessa Gibson and Fernando Cabrera, while they’ve said the plan still needs some improvements, have also expressed positivity about the proposal. And Diaz has not been shy about promoting development in the borough. But the rezoning proposal has also been subject to considerable controversy, and most people who came to testify at the Bronx Borough hearing spoke against the plan, citing concerns that the rezoning will not provide housing sufficiently affordable to current inhabitants, will exacerbate the harassment and displacement of existing residents and decimate the area’s auto industry, which is a source of blue collar jobs for many immigrants in the area. At that hearing, Diaz tried to convey that he was listening carefully. Proceeding Monday’s vote, Carol Samol, the director of the Bronx Office of the Department of City Planning, gave a presentation to the Borough Board on the Jerome Ave study, arguing that the planning process was community-driven and noting that it brought together a host of different agencies to address a variety of different issues. She also listed some of the initiatives and investments that have been made already or will accompany the rezoning, including a prior investment of over $800 million to preserve the affordability of existing housing, the creation of senior housing and parkland on undeveloped land marked for parkland*, intensified code enforcement efforts, a commitment from JobsFirstNYC to help the neighborhood build a workforce referral network and other initiatives. Next, several local elected officials discussed the investments that they’ve helped to secure from the administration and the ones they still hope to get as the ULURP process continues. Some new city commitments included financing for the preservation of another 1500 units of affordable housing over a two-year period, the piloting of a certificate of no harassment program that will require landlords to certify they aren’t harassing tenants before undertaking renovations, and further discussion on the expansion of the areas where auto-zoning will be kept in place, among other promises. James said the city has also committed to expand the rezoning to nearby land owned by the supportive housing nonprofit Services for the Underserved, which will build 400 units of supportive and below-market housing and new open space. Indeed, on November 1st the Department of City Planning filed an “A-application,” which will add some more blocks to the rezoning area, including between three and eight additional sites that might be redeveloped, according to the city’s predictions. But Rausse said the Borough President is still calling for guarantees of additional school seats, the preservation of at least 2000 units, the identification of alternative locations for displaced auto-businesses along with adequate funding for relocation, investments in making local subway stations accessible, a new community center in Highbridge, and more. Read Diaz’s full response to the Jerome Avenue rezoning here; his conditions on are on pages 20 through 22. Gibson highlighted the city’s progress on tenant protections and construction safety while similarly stressing that the Jerome Ave plan needs school seats, a better plan for the auto-industry, the creation of a community center, accessibility and increased transit service. Deputy Borough President Aurelia Greene, on behalf of Diaz, cast a vote of yes with conditions. The City Planning Commission will hold a public hearing on the rezoning on Wednesday November 29 at 10 a.m., 22 Reade Street in Manhattan. *Clarification: According to the Department of City Planning, the part of the block where the senior housing will be located is not suitable for parkland. Some advocates dispute this characterization. I have lived in this area for 42 years in a one br. N when everyone was leaving I stayed n fout for my family n now because of this we r under attack by greedy landlord’s n my son works as a security guard n can’t afford to rent any of these so called affordable housing!! Once again we have been sold out this is not going.to help the family’s that are doubled up or have been displaced. The City Planning Commission listened to passionate testimony regarding the proposed Jerome Avenue rezoning.